Bill Gives a talk on the importance of understanding and living in Non-duality as essential to attaining the experience of Awakening described as the knowing of the Real World expressed in A Course in Miracles and how very simple it is to know of this experience. Enjoy! This course remains within the ego framework, where it is needed. It is not concerned with what is beyond all error because it is planned only to set the direction towards it. You can print the handout and worksheet for the webinar so you can take notes for each of the questions. Bill Free article about Non-duality and Rupert Spira page 16-19. 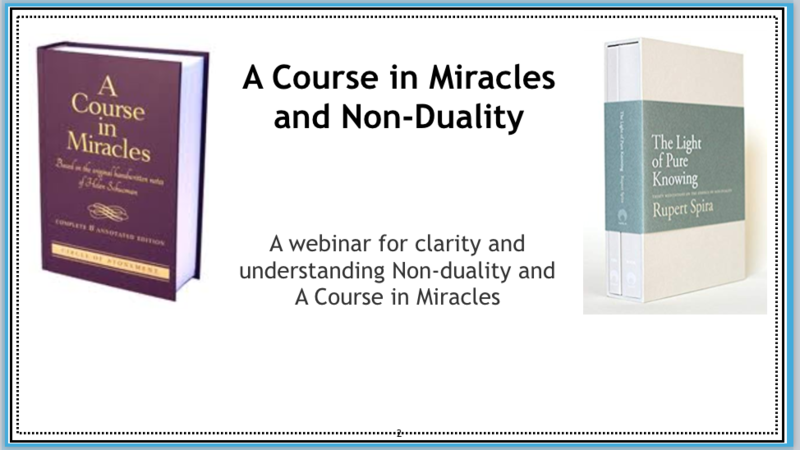 This live workshop will invite you to join other Teachers/Students of Non-Duality and A Course in Miracles to explore the teachings of A Course in Miracles and the Non-dual Direct path of Self Realization as taught by Rupert Spira, Francis Lucille, Jean Klein, with quotes by Mooji, Yogananda, Maharaj and see how they can fit together for a more clear and better understanding for attaining the goal they all serve. God, Him, You, We, I, Me, Jesus, The Holy Spirit, Spirit, Your Brother, Mighty Companions, and other metaphors/symbols such as Salvation and Forgiveness and how these Christian terms can better serve you when understood through a different filter of reference. We will be exploring the dualistic language of The Course and it’s practical application along with the Non-dual nature of what The Course is pointing to, described as The Direct Experience and that god will take the final step. The Non-dual direct path is very clear in the distinction that we are what God is and yet the dualistic language of The Course that so many of us use may be preventing this direct experience that The Course points to. We will give answers or insights to these questions and more. What does The Course mean when it says? God will take the final step? Who am I praying to when I say Father? How to Listen to The Holy Spirit or Jesus? – Are these separate entities? Who am I speaking to when I speak to Jesus? Is A Course in Miracles a non-dual teaching? 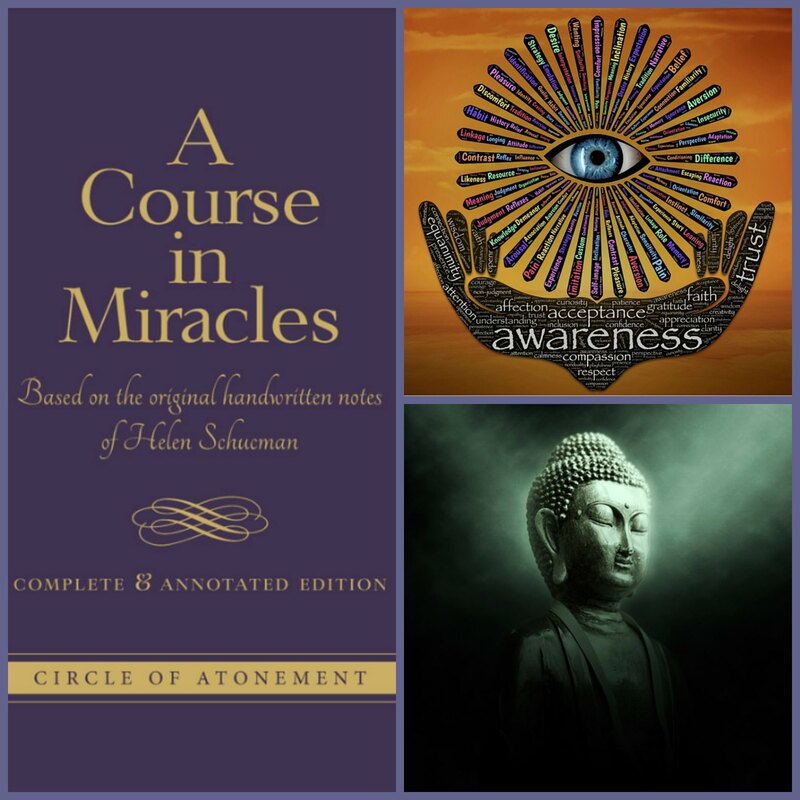 What is the goal of A Course in Miracles? How would A Course in Miracles student get the most from A Course in Miracles? What should A Course in Miracles student do for the most benefit of awakening during or after completing The Course? Is a Non-dual understanding necessary for salvation according to the course? Will A Course in Miracles bring it’s practitioner/student to the experience of enlightenment? Can I be awake and not enlightened? Is the Non-dual path necessary for full enlightenment? What are the benefits of using both the Non-dual direct path and A Course in Miracles? Is there a downside to following both paths? We will most likely not get to all of these questions in part I, hence this will be a webinar series. What question above would you most like to have answered? Please fill out the survey on registration and let us know or contact me directly at billfreeonline@gmail.com. How do these two paths fit together? True Perception and The Real World. We will do our best to give understanding to these questions and more.